View this as a web page. Martin Conradi is managing director of Showcase Presentations in London. Educated at Oundle School and Lancaster University, he spent 10 years in advertising and marketing companies and doing more than his fair share of presentations. He became fascinated by the potential for small computers as business tools and set up Rainbow Software in 1980 -- probably the first company in the world entirely dedicated to computer-based business presentations. He formed Showcase Presentations Ltd in 1986 to specialise in computer-based presentation services. In this conversation, Martin looks at the future of presentations, from a past perspective. Read this exclusive conversation with Martin Conradi. Among the various improvements that authorSTREAM made to their video engine, HD video conversion is the one that stands apart. This improvement is significant since it will make all the difference in the world to those who need to quickly create high resolution video output. So what do you need to create this high quality video output, and where can you use it? Let's first answer the second question and then look at the first one for the rest of this post. Learn more about authorSTREAM's HD video output. Anyone who has heard me speak about charts knows that I'm not a fan of three dimensional (3D) charts. Here are the reasons why. All charts can present problems in conveying information if used improperly. What makes 3D charts unique is that their major problem is inherent in the chart design itself -- namely, the confusion induced by the depth of field effect. Conveying a third dimension on a two dimensional surface creates difficulties for the eye and the brain. Just look at some of the fantastic optical illusions that prey upon the brain's bewilderment when confronted with a 3D simulated image on a 2D plane. In this component of our Segment Circles series, we have brought you a non-segmented full circle. You can use this circle in your presentation like a picture container. We have used basic PowerPoint shapes to create most of these conceptual designs. Also, some of them are imported from other graphic programs and converted to PowerPoint shapes. The sample presentation that you download comprises one unsegmented circle within two separate slides -- one with a picture fill, and the other with just a solid color fill. Copy these slides to your PowerPoint presentation and change the fills and effects of individual segments as well as the thin donut shaped circle around the segment, using PowerPoint’s fills, lines, and effects. Download and use these segment circle graphics in your slides. These ready-made silhouette graphics of people holding hands are inspiring, and also so practical to use since they don’t represent any community or nationality. You can use them to depict themes such as unity, togetherness, diversity, team spirit, etc. These are simple graphics, yet can provide amazing results when utilized with creativity. Once you have downloaded the sample presentation, all you have to do is copy the silhouette graphics and paste them in your slides. Download and use these silhouette graphics in your slides. Getting your PowerPoint tasks done quicker is just one of the benefits you will gain by using keyboard shortcuts. Are you aware of all PowerPoint keyboard shortcuts? Want to check if your favorites have been included in this e-book, or if there are a few that can help you perform your PowerPoint tasks quicker and better? Or if you don't use keyboard shortcuts, do you want to get started? This 56 page PDF e-book downloads quick, costs you $0 or more, and is a valuable resource. The PowerPoint Keyboard Shortcuts E-Book covers the last three Windows versions of PowerPoint: PowerPoint 2010, 2007, and 2003. And now, the e-book has already been updated for the new PowerPoint 2013 Consumer Preview. 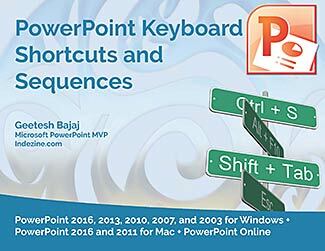 Get this PowerPoint Keyboard Shortcuts E-Book now.